So I've gone and made another grain-based salad for you, this one with my beloved quinoa. I know, I just posted a grain salad in the form of Argentine tabbouleh, but something about summer makes this type of food just the right thing for lunch or a mid-afternoon graze in the refrigerator. The grains make them hearty and filling, but the veggies and general coolness of it all keep them light and appetizing even when it's humid and 90 degrees outside. Which, inevitably, it is. I created this salad mainly as a vehicle for some spicy, roasted pepitas that I made the other day. I've found recently that I really like pepitas, and was inspired by a recipe I saw somewhere to roast them with some lime, salt, and spice. They are pretty tasty on their own (in fact, so tasty that I'll even include the recipe in this post! ), but I was hoping to incorporate them into a meal-type of dish, instead of just leaving them to be snacked on. Eating pepitas puts me in a Mexican-New World-y kind of eating mood, so I decided to add them to a sweet potato-studded quinoa salad. I had originally planned to roast some sweet potatoes and top them with a pepita-based sauce of some kind...but the quinoa was calling out to me. In any case, I'm glad it was, because this salad was really delicious and pretty, to boot. I chose to use my favorite white yams, along with black beans and roasted, sweet red onion. To really make it a New World salad, I should have added some corn instead of peas to the mix, but the flecks of cilantro didn't quite add enough green on their own for this to be considered a salad. Besides, I like peas more. I dressed the quinoa very simply, with just some lime juice, a few spices, and a wee bit of olive oil. I suppose this is the juncture where I advertise my salad as a great alternative to potato salad for your next barbecue or picnic. Lately it seems that everyone has been suggesting hipper, lighter, healthier, and zestier alternatives to the much-maligned traditional potato salad. I personally don't see why potato salad has to be such an integral part of outdoor get-togethers, but if you do, then by all means use this delicious, healthy, potato-containing salad as a "substitute." Indeed, it's perfect for large-group entertaining, and can be scaled up almost effortlessly. Just a few notes: I roasted my red onions, because I happened to be roasting some other vegetables and it seemed easy enough to toss a few onions into the mix. Roasted onions are gifts from the gastronomy gods, but you can also quickly saute them, or just toss them in raw, if you're into it. I find that boiling the sweet potatoes (after dicing!) is both quick and easy; just make sure not to overcook them, or else they'll get mushy. After boiling, I quickly drain and then season the sweet potato cubes with a bit of cumin, cinnamon, cayenne, salt, and pepper. Oh, and the pepitas: they add an amazingly delicious crunch to this salad, which is why you'll see the recipe below. If you must, leave them out, but they look so pretty, and add another dimension (in flavor and texture) to the dish. Enjoy! Mix lime juice, oil, and spices in a bowl. Add pepitas, and toss to coat. Spread in an even layer on a foil-lined baking sheet and roast at 375 degrees until golden, puffed, and fragrant. This takes about 10 minutes in my turbo-oven, so allow 15-20 in a normal oven. Check frequently, and stir to ensure even roasting. Roast or saute the red onion. Meanwhile, boil the diced yam until just tender, about 8-10 minutes. Drain the yams and season to taste. Add 1 1/4 c. water and quinoa to a small saucepan and cook, being careful not to overcook the quinoa or let it burn. If needed, add extra water to the pan so that quinoa can cook completely. Let cool to room temperature before mixing with other ingredients. 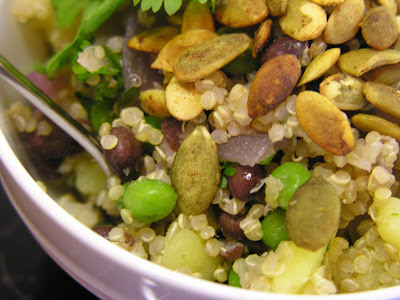 In a large bowl, mix quinoa, yam, onion, peas, and beans. Stir to combine, and then drizzle with oil and lime juice. Season to taste. Before serving, add cilantro and pepitas, and stir to mix, reserving a bit of each for a garnish, if desired. Tastes great chilled or served at room temperature. This looks like an absolutely delicious salad. I love the crunchy seeds on top.